Recently, I was in Swindon, which as we all know is a place that terraformers are expressly forbidden from recreating. I was in the lift (or the elevator, depending on where you come from) at the car park, with an elderly woman, and a couple of guys and a woman around my age. We were squashed uncomfortably into the lift with our bags, and that awkward silence descended. You know the kind of silence I mean. The kind that makes you want to break wind. Anyway, we were all shuffling our feet, and trying not to make eye contact in case anyone thought we were weird. All very British. Then the woman who was about my age chirped up with, "You ever get that awkward moment where you're in the lift and realise you can't remember what floor your car is on?" One of the guys smiled, and said, "I was literally just thinking the same thing." By the time the lift stopped on my floor, everyone was laughing and chatting. I left them to it, with a cheerful, "Good luck" as I headed for my car. Mainly because I don't have any interesting anecdotes to tell you. But also, it reminded me how much better life is when you reach out to the people around you; when you stop and speak to someone rather than casting your eyes down or pretending to check messages on your iPhone. In our lives, we spend so much time being insular, and shutting people out, and putting on a front, and pretending we know where our car is. When you stop doing that, the world gets a little brighter. And that is what I love about board games. I love getting people together to talk and interact; to laugh and have fun. Recently, I found and fell in love with a game called Winter Tales. It is a storytelling game, and it creates the most wonderful setting for a group of friends to craft a fantastical adventure. However, it is a game where the story is more important than winning. That's great; but sometimes people want to laugh and have fun and WIN. 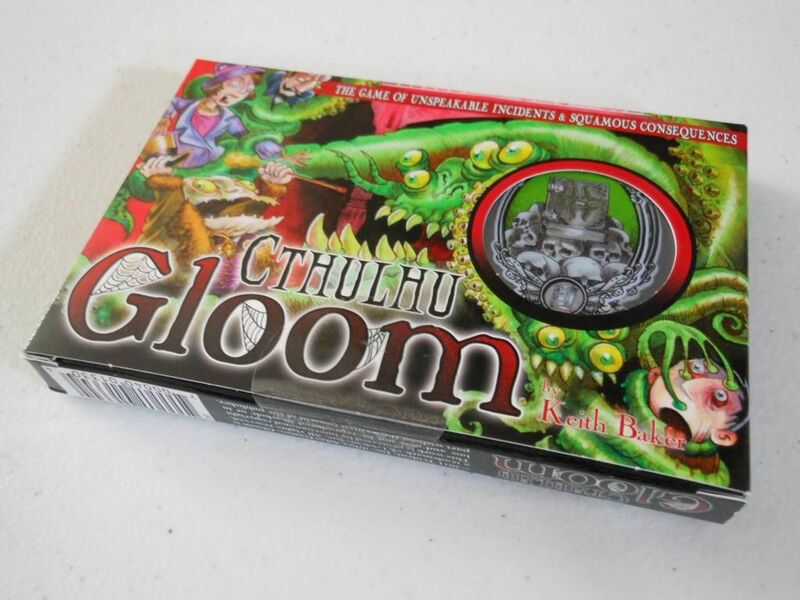 Cthulhu Gloom fits the bill perfectly. The rules could be nicer. 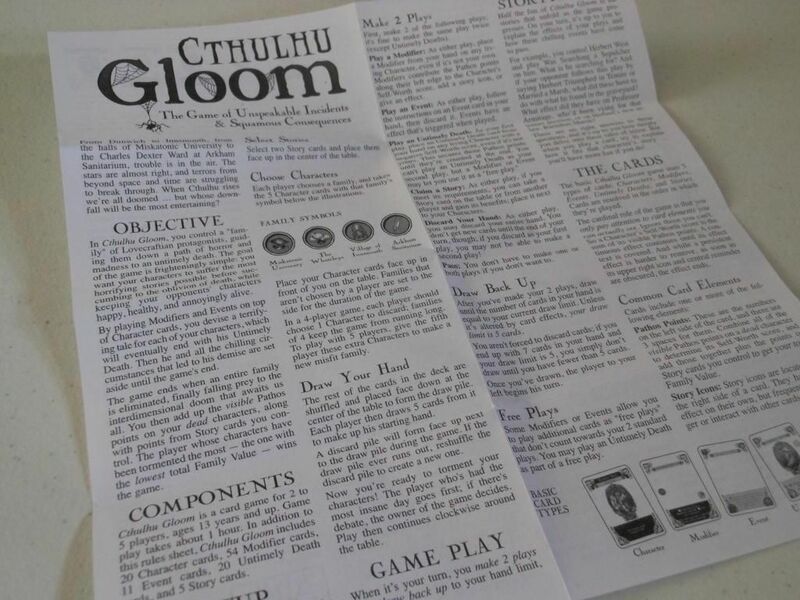 Cthulhu Gloom is the inevitable Lovecraftian retheme of the game Gloom. It is a simple card game with a fiendishly entertaining goal: Players have five family members under their control, and must make them as miserable as possible before killing them off. At the point any one family is wiped out, everyone adds up how miserable their dead family members are, and the person who generated the most misery wins. It sounds macabre, and it is. It sounds miserable, but it most certainly isn't. The game is actually exceptionally simple. Players have a hand of events, modifiers, and untimely death cards, and on each turn players take two actions, which normally involves playing two of those cards. Modifiers are played directly over the top of family members, making them happier or sadder, and also giving them other characteristics called "story icons," which other cards key off. 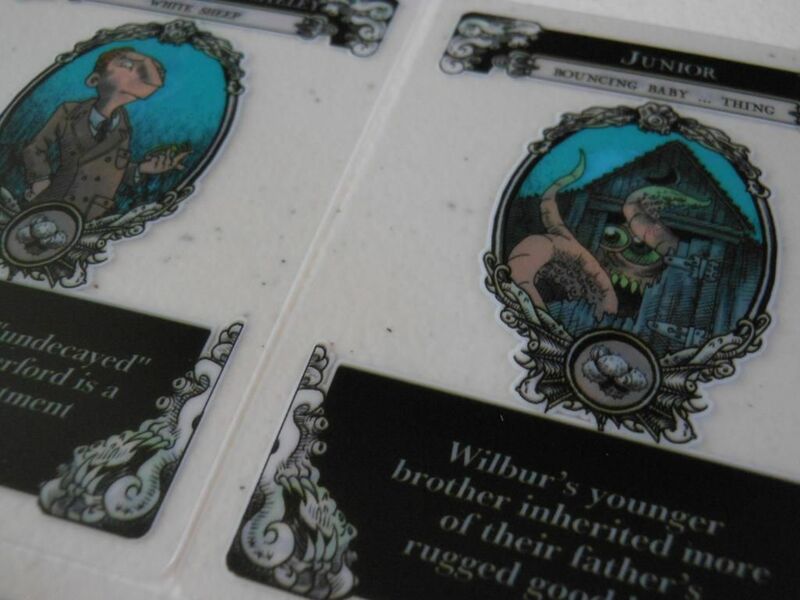 This unique method of applying modifiers to the characters is achieved through the use of transparent cards. As the cards are stacked, certain elements show through from the card below, while other elements are blocked out. The transparent cards are cool. It sounds a bit gimmicky, and I suppose it is. But it also works beautifully. But it is also, at the very heart of it, just a "screw you" card game with limited strategies. You usually play bad cards (er, good cards, I mean) on other players, and good cards (I mean, bad cards) on yourself. You try to mutate your characters so they have the correct combinations of "story icons" to trigger events, make them unhappy, and then kill them, while trying to ensure your opponents stay happy and very much alive. What really lifts the game, giving it the boost it needs to become truly entertaining, is the optional storytelling rule. Every card has a title, and maybe a funny piece of flavour text and a picture, but ultimately, each one is a blank canvas. A blank canvas for the players to fill with their own brand of storytelling. For example, one of the untimely death cards is titled, "Will never stop screaming." But why? What does it mean? What did the unfortunate victim see? 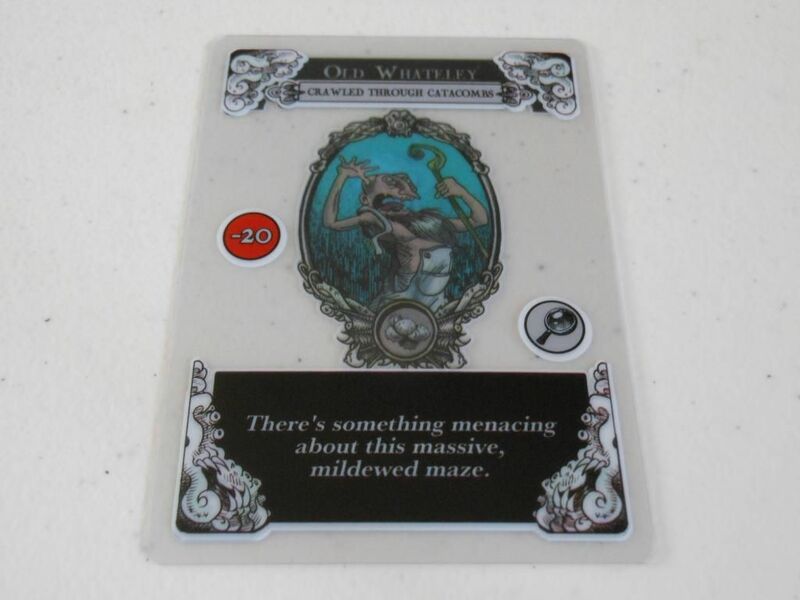 The rules encourage players to create a backstory for every card they play, to flesh out these tales of woe. And that, for me, makes this game an absolute joy. 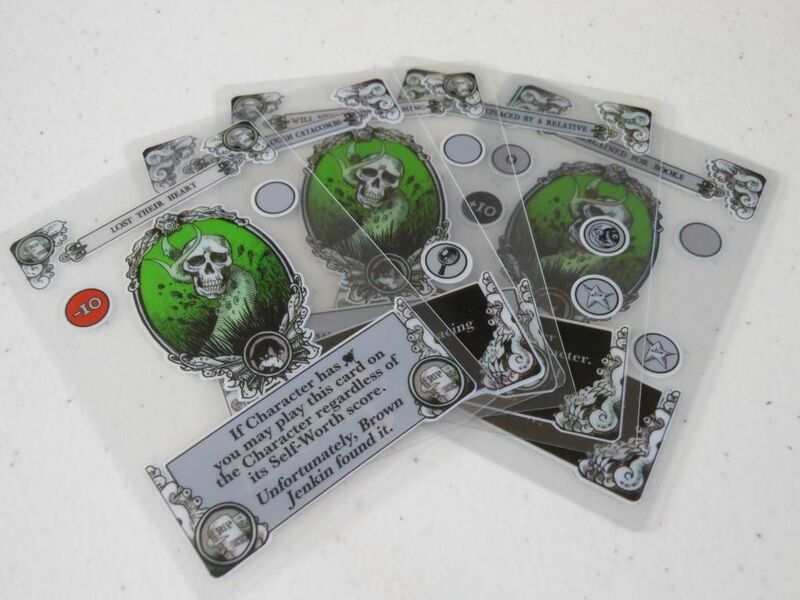 At its core, it is a simple card game with a very basic rules set, but like the layers you make with the transparent cards, it is possible to layer the basic game with a layer of storytelling that really brings the game to life... er...death. Whatever. Old Whateley didn't enjoy crawling through catacombs. Now, there are some down sides. Isn't there always? First of all, the deck of cards is relatively small. In one game, you will probably see most of the modifiers and untimely deaths. Some variance is added by the random addition of two story cards for players to fight over, but there are only five of those. After a couple of games, you have seen everything the game has to offer, and that does hamper the storytelling aspect slightly. Basically, if players get this to the table often, then they are going to start regurgitating the same old stories as they see the same old cards time and time again. It is also worth noting that storytelling games are not for everyone. Some people are too shy, and some people are not very good at making things up on the fly. If you have a gaming group like that, you can still play Cthulhu Gloom, but you are missing out on one of the best aspects, and you may find the game a little too light and repetitive to have staying power. I really wouldn't recommend the game to groups who do not intend to embrace the storytelling concept. Finally, and it has to be mentioned... Cthulhu. H P Lovecraft is one of my favourite authors, and his writing has had a huge influence on me; but even I begin to tire of all the Lovecraftian board games on the market. It is almost as tiresome as the number of zombie games. Furthermore, for people who do not know the works of Lovecraft, many of the jokes and characters in the game are going to go right over their heads. 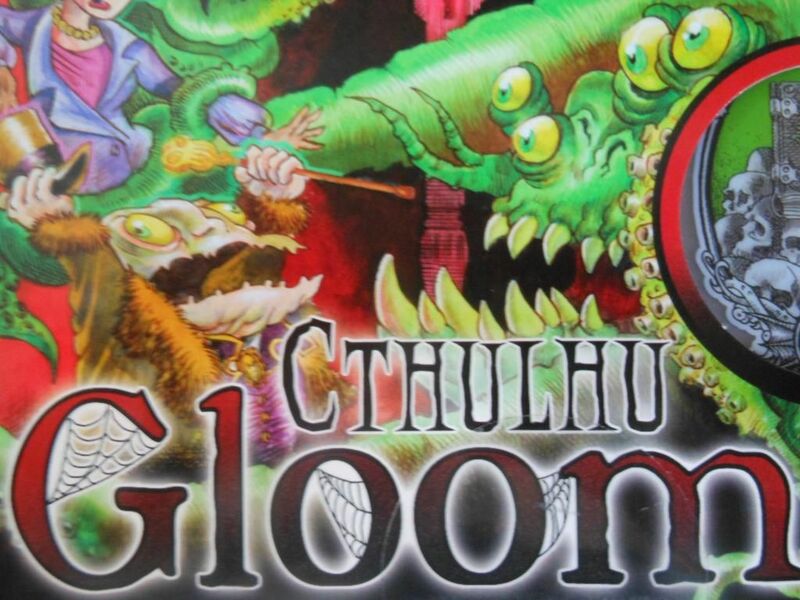 For those people, I would recommend good old regular Gloom instead, which has the same macabre vibe, but without the Cthulhu theme. And that's it really. I don't have anything else negative to say about the game. The plastic, transparent cards shuffle well, and work perfectly; the art is excellent; the jokes are genuinely funny; and the game is solid without the storytelling, and truly joyous with the storytelling. The Whateley family are a fun bunch. It may be a game about making people miserable, yet it has the potential to create such mirth. But it is important to do it with the right group of people. Which is a good rule of thumb for riding on the lifts in Swindon too.